Despite all this, fluoridationists have mounted a marketing campaign to promote fluoridation mandates based on a hundred year old dental myth. Incongruously, at the center of this scheme is the Department of Health and Human Services (DHHS) and Centers for Disease Control (CDC). Fluoridation is a profitable business for some, and over the years too much organizational prestige and too many paychecks have become inextricably linked with fluoridation promotion in the network of government regulatory agencies. Consequently, our tax dollars are being used to create marketing materials that incentivize states to fluoridate using Medicaid monies in a move that most harms the health of the very population Medicaid is supposed to serve. Lobbyists are presenting these materials to state politicians while public relations experts are planting pro-fluoridation articles in the press. Fluoridationist organizations also have apparently created curriculum targeting college students that encourage students lobby for fluoridation based on the disinformation in marketing materials. Moreover, citation cartels are manufacturing fraudulent reports and studies that misrepresent both historical and scientific fact. These unprincipled papers are widely promoted by vested interests in popular press using biased language. They are aided by self-important bloggers with decidedly prejudiced points of view. Talk about anti-science and dishonest media. This astroturfing effort is further supported by an organized troop of trolls who overwhelm social media with vitriol that dismisses arguments, denies science, denigrates opponents, distracts the public, and disrupts conversation about the real health risks of fluoridation policy to consumers. 10. Fluoride contaminant thresholds set by the EPA were found to be not protective of human health in 2006 by the National Research Council who also advised that at that time they could find no science that proved fluoride in drinking water was safe at any concentration. That panel of experts also stated that it was reasonable to anticipate adverse effects from fluoride consumption among vulnerable populations at much lower water concentrations. Those ill effects would include gastrointestinal disease, endocrine disorders, kidney damage, and skeletal deterioration. The EPA has failed to take action. Fluoridation policy is politics pretending to be science. It protects corporate health not consumer health. Fluoridationists are motivated by power, prestige, and paychecks. They ignore actual science and the voices of thousands of dentists, doctors, toxicologists, research scientists, consumer advocates, environmentalists, and civil rights leaders who have concluded that although there may be benefit to brushing your teeth with the stuff if you have no medical contraindications, spit, don’t swallow. Contact your representatives at municipal, state and federal levels. Tell them that fluoridation is ethically and economically unsustainable. Begin by signing this petition to Congress and the Institute of Medicine demanding a review of modern science and a controversial 20 year old Food and Nutrition report. Follow up with a phone call to your representatives’ offices. 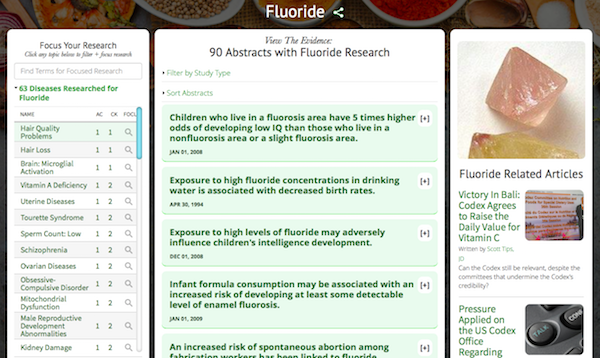 For evidence-based research on fluoride, visit the GreenMedInfo.com Research Dashboard.